Specialized Bicycle Components “Happy Entrails” (01:10) # “Fun ’til the end” is the promise in this effort for Specialized Bicycle Components. 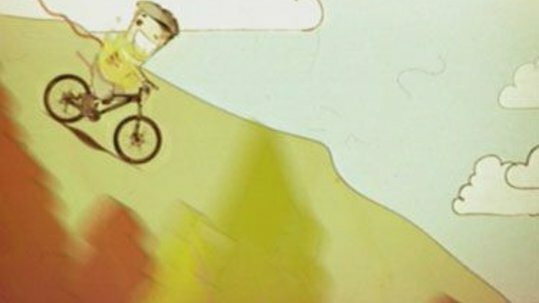 In a commercial reminiscent of the South Park comic series, we see a happily grinning boy tearing around the countryside on his “Stumpjumper” mountainbike. Yet dangers lurk around every corner as a bear rips out his intestines, he is struck several times by lightning and, to cap it all, a lumberjack chops off one of his hands. With blood gushing out of him, he continues on unperturbed, only to stop off at a place where children are playing, and it here that he finally meets his end as they let him go up in flames.